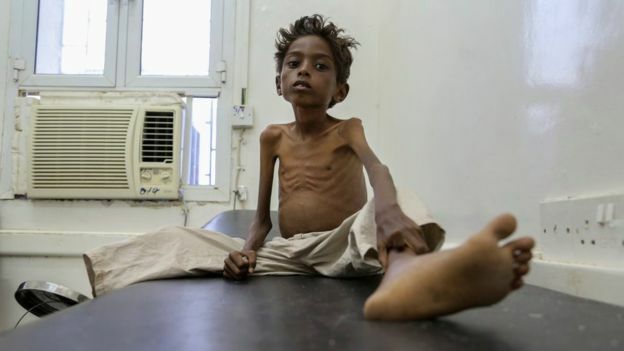 UN humanitarian chief Stephen O'Brien said that more than 20 million people faced the threat of starvation and famine in Yemen, Somalia, South Sudan and Nigeria. Mr O'Brien said $4.4bn (£3.6bn) was needed by July to avert disaster. "We stand at a critical point in history," Mr O'Brien told the Security Council on Friday. "Already at the beginning of the year we are facing the largest humanitarian crisis since the creation of the United Nations." "Now, more than 20 million people across four countries face starvation and famine. Without collective and coordinated global efforts, people will simply starve to death. Many more will suffer and die from disease. Children stunted and out of school. Livelihoods, futures and hope will be lost. Communities' resilience rapidly wilting away. Development gains reversed. Many will be displaced and will continue to move in search for survival, creating ever more instability across entire regions." Mr O'Brien's comments follow on from a similar appeal made by UN Secretary General Antonio Guterres last month. Like Mr O'Brien, he urged more financial support for the four countries. But why are they in such dire need? The pictures were among the most shocking of last year: emaciated children, clinging on to life with what little strength they had left. Four-year-olds not bigger than infants. And mothers unable to do anything to stop their children dying. 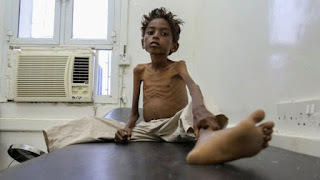 It is thought a child dies every 10 minutes in Yemen from a preventable disease, while half-a-million children under five are suffering from severe acute malnutrition. The UN estimates some 19 million people - or two thirds of Yemen's population - is in need of some sort of humanitarian help following two years of war between Houthi insurgents and the government, which is backed by a Saudi-led coalition. Continuing fighting, lack of rule of law, poor governance, under-development. A naval embargo imposed by the Saudi-led coalition, fighting around the government-controlled port of Aden and air strikes on the rebel-held port of Hudaydah, have severely reduced imports since 2015.